The Andean mass wedding that happened in La Paz over the weekend — with Bolivian President Evo Morales presiding as best man — was held in a coliseum adorned with white flowers. 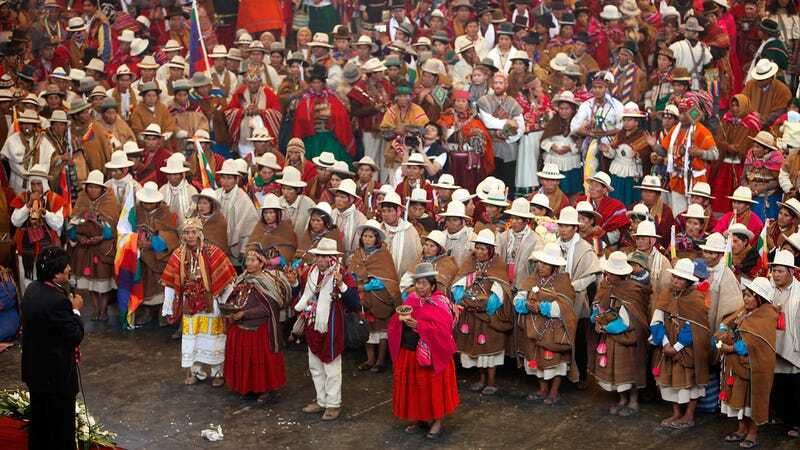 Indian religious leaders presided over the wedding as did symbolically Pachamama — the earth deity of the Aymara and Quechua races of Bolivia's highlands Indians. The UK isn't the only place where you can find big hats at nuptials. FYI: Before the ceremony, each couple married in a civil ceremony. Many brides and grooms were dressed in vibrant, hand-woven ponchos and wraps. These flowers and stripes are gorgeous!